Published in the South Kent Gazette, 4 April 1979. This book is mainly historical, although not arranged in chronological order, the writer having followed in the steps of William Lambarde, and made a Perambulation of the Borough of Dover in, 1907, as Lambarde did of the County of Kent in 1570. A History of Dover, arranged in the ordinary sequence of events, was scarcely needed, because the Rev. S. P. H. Statham wrote such a work less than ten years ago; but, this book deals with Dover in a way never before attempted, its whole history being presented, not in the dry form as garnered in official records, but fresh, as it grew around its building’s, streets, harbour, quays, and fortifications. For the assistance of those not much acquainted with Dover, the book commences with a comprehensive historic summary, affording a bird’s-eye view of Dover affairs from the Roman Invasion to the present day, after which commences the Perambulation—the gathering up of facts, traditions, and folklore, arranged in sections, in which places and things having affinity are grouped. The writer has ventured to transgress the usual canons by not loading his work with references to authorities. The main object has been to present a faithful representation of Dover as it has gradually taken shape from age to age, and as it is to-day. The task of gathering the materials has afforded the writer many years of keen enjoyment. THE ROMAN OCCUPATION OF DOVER! TRANSITION TO SAXON RULE: THE COMING OF THE NORMANS; ANCIENT FORMS OF GOVERNMENT AND MODERN DEVELOPMENT. “Dost thou know Dover?" To those who do not, an outline of local history will be acceptable. Of the Ancient Britons who dwelt at and around Dover, little is known; therefore, we will begin with the Roman Period. Julius Caesar, in planning his invasion of Britain, B.C. 55, regarded the estuary of the Dour, then existing between the Dover eastern and western heights, as a desirable place to disembark his troops; but the ancient Britons, even with their primitive resources, proved that those heights were capable of successful defence. The Romans, however, made good their landing eastward of the Foreland. When the Roman occupation began, a century later, A.D. 43, under Claudius Caesar and his generals, a station was established at Dover, and portions of their work still remain on the southern part of the precincts of Dover Castle — including, of course, the Pharos — and, as recent excavations have shown, substantial foundations of a Roman fort of later date exist under the York Street-Market Street area. When the Romans gave place to the Saxons, the first rude settlers were more prone to destroy strongholds than to build them; but when their children, in their conflict with the Danes, had learned to value stone built fortresses, they surrounded the Roman mounds on the Castle hill with walls and towers; and, after embracing Christianity, they converted a Roman watch tower into the church which still stands near the grey ruins of the Roman Pharos. The fortifications of Dover Castle were much strengthened by Earl Godwin, in the last days of Saxon rule, making it a formidable fortress. The Norman invaders, who landed near Hastings, acknowledged the strength of the position by marching here to seize Dover before advancing on London; and, subsequently the Conqueror showed his high estimation of the Castle by making it his great frontier fortress. At Dover, the Norman surveyors commenced the compilation of the Kentish portion of their great Domesday Book, first making a detailed entry of the King's possessions in this town. That Crown property, from the beginning of the Norman era, was administered by the King’s Bailiff, who was an important man in Dover affairs, sitting beside and acting with the people’s man — the Mayor; and those two, with certain modern modifications, continuously administered local justice from the Norman days until recent times. The Dover Recorder — a post which has now become a purely honorary one — Is the modem counterpart of the Norman Bailiff. The Recorder presided over Quarter Sessions, yesterday’s equivalent of the Crown Court. The last man to preside at the Dover Quarter Sessions, which were abolished in November 1971, was Mr. John Huxley Buzzard who still holds the post, but in an honorary capacity. The governing body of Dover, in the course of time, was enlarged, the Mayor having associated with him, for the administration of Justice, a Bench of Jurats; while, for the transaction of ordinary business, the whole of the Freemen formed a grand Council. Dover was a member of the Confederation of the Cinque Ports and the seat of its government, the Lord Warden of the Cinque Ports being the Constable of Dover Castle; and, although for the sake of the convenience of the several Ports, the High Court was usually held In a tent at Shepway Cross, near Lympne, the centre of the Lord Warden's administration was always Dover Castle. The ecclesiastical authorities at Dover also claimed independent jurisdiction. These were the Canons of St. Martin, who, dating from the introduction of Christianity into Kent; acknowledged no superiors, save God and the King; and they were the only landowners in Kent who were not dispossessed at the Conquest. Early in the Norman time, however, their independence was broken down by the influence of the Archbishop of Canterbury, who induced the King to displace them to make room for more subservient ecclesiastics — the Monks of the Dover Priory and the Master and Brethren of the Maison Dieu. 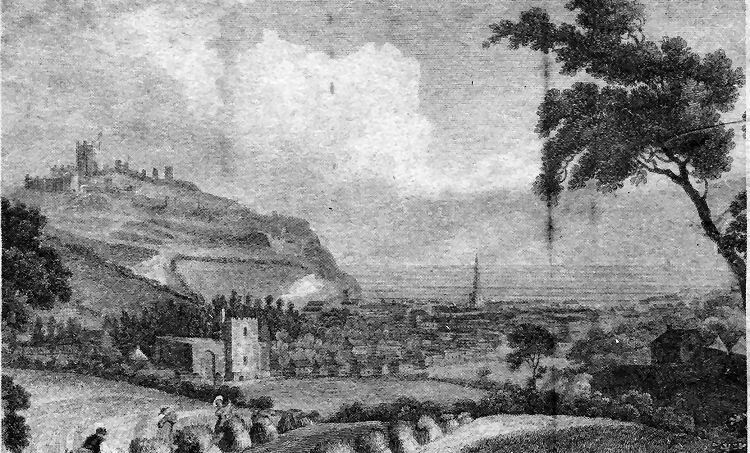 A view of Dover across the cornfields of Priory Hill, from an old print dated 1807 - that was a century ago when John Bavington Jones, editor and proprietor of the Dover Express published his popular history of Dover, described as “A Perambulation of the Town, Port and Fortress“ in 1907. The print was the frontispiece. Printed at the old Snargate Street printing works of the paper the book was a sell-out and ever since there have been hopes that it might be reprinted Over the years there have been many inquiries as to whether the 1908 book is still in print. Now it has been decided to print a revised edition, to be published in weekly instalments in the Dover Gazette, in a form which lends itself to pasting into a loose-leaf scrapbook.